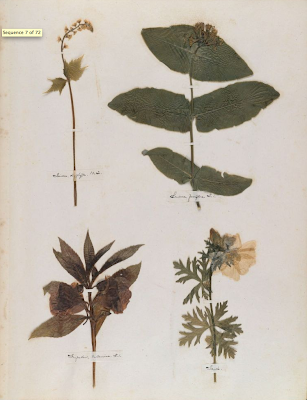 To start Poetry Month, here is a link to the digitized version of the Herbarium that Emily Dickinson made circa 1839-1846. The original is in the Houghton Library at Harvard University. Here's more about the Dickinson collection at Harvard. And here is a post on Poetry.org by Judith Farr, who wrote the excellent book, The Gardens of Emily Dickinson. You can view The Wondrous Nearer Drew, my "collaboration" with the words of Emily Dickinson here. A daguerreotype of middle aged Emily Dickinson recently surfaced in Chicago. It can be seen at www.kaplancollection.com.